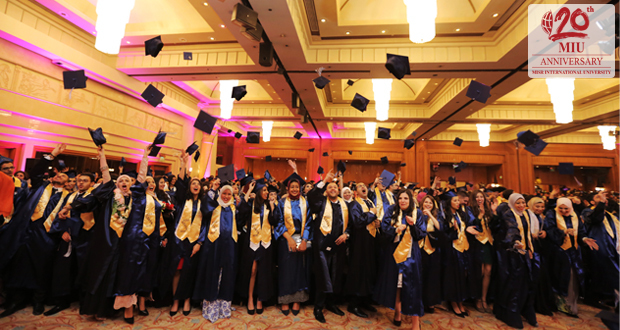 Misr International University celebrated its 16th graduation ceremony on March 2 and 3 at the Intercontinental City Stars. The faculties of Business Administration and International Trade, Pharmacy, Computer Science and Engineering Sciences and Arts held their joint commencement on Wednesday March 2. The faculties of Mass Communication and Alsun, and Oral and Dental Medicine held their commencement on Thursday March 3. The ceremonies were conducted under the auspices of Mr. Hussein El Rashidy, the founder of Misr International University, Mr. Mohamed Hussein El Rashidy, the president of the board of trustees, Professor Mohamed Shebl El Komy, the president of Misr International University, Faculties’ Deans, and Professors. MIU, which has an inveterate history in the education field, has graduated a total number of 10028 students since 1996 from different faculties like Mass Communication and Alsun, Engineering Sciences and Arts, Business Administration and International Trade, Pharmacy, Computer Science, Oral and Dental Medicine.